What Is a Psychic Symbol? Have you ever experienced an "Aha!" moment or wondered why it feels like you just know something without knowing how you know it? Have you ever woken from a dream only to have the events in that dream become reality during your day? Have you ever experienced a sign so strongly it caused you to change your mind or direction? All of these moments you've had are part of the incredible world of psychic symbols and intuition! Luckily, you don't need to be hit over the head, have a near death experience, or grow up seeing dead people to recognize psychic symbols. Everyone receives intuitive messages; we need only identify them to appreciate the vast realm of information available to us. Being intuitive is part of our natural birth right. Tapping into your intuition comes with a price. It causes you to break free from a mundane, ordinary life and challenges you to live outside the lines. It creates normalcy out of what is otherwise thought of as different. Being intuitive generates a longing to follow a path that can lead you to something greater than you could ever imagine. Being open to receiving psychic symbols and trusting those messages will most definitely change your life, and once you become aware, you may never want to go back. I grew up "normal." I was an average kid, living an average life, reading people's energy, and thinking that all people did the same thing. It wasn't until I was an adult that I truly recognized my gifts as a psychic; that's when I began regularly talking to dead people and recognizing synchronistic events as more then mere coincidence. Like I said, I was normal. After all, what is normal? I set out to develop my intuitive gifts, and being a Libra who craves balance, I did so with a dose of healthy skepticism. I know, without a doubt, that psychic awareness is real, and it is through symbolic representations that we psychically receive intuitive thoughts, images, ideas, sounds, and feelings. The pieces of information we receive are what I call psychic symbols. Where Do Psychic Symbols Come From? Recognizing these psychic symbols as messages becomes easier once you understand how the communication is being made. We all process information differently and receive impressions in different ways. Some people are predominantly visual in their everyday lives, and will usually see things psychically, or clairvoyantly. Others are more in tune with their clairaudient, or clear hearing, abilities. Still others will feel or sense things; this is called clairsentience. Taking it one step further, we realize that sometimes we just know things. When this happens, claircognizance is the gift we are using. Finally, we have clairalience (clear smelling) and clairgustance (clear tasting). Having one psychic sense prevail over another does not mean we can't receive information in many ways. More often than not, I communicate with the other side using a combination of psychic abilities; it is the coming together of the different senses that helps bring depth to the symbolic impressions I get. It's taken me many years, and thousands of readings, to put together my catalog of psychic symbols, and I'm still adding to it. I'm often asked, "How can you possibly know that?" I credit the symbolic information sent from the other side with what I share in a reading. Deceased loved ones, friends, and relatives are a direct line of psychic communication from the other side. Spirit guides, angels, and helpers also send us an abundance of psychic symbols to help direct us in life and in readings. Here's where it gets tricky for professional psychics and lay-people alike. Imagine a radio; there are thousands of frequencies. In order to hear what's being broadcasted we need to fine tune the dial to the exact frequency a particular broadcast is being transmitted on. It's the same with psychic communications; imagine trying to tune in to a radio station that's on a whole different plane of existence. Fortunately for us, these deceased loved ones and guides don't give up; they want to help us and share information with us. They will use whatever they can to assist us in understanding what they are trying to tell us. They send images they think we can recognize. Common symbols like flowers or birthday cakes or even colors and scents mixed with more personalized symbols can get the messages to us. It's not like we have a clear line transmission where someone tells us word for word what they want us to know. Instead, the other side uses these symbols to get their information across. How Can We Tell the Difference Between Our Imagination and a Symbol? Sometimes we can't! But, that's okay. Just think of it this way: a symbol can be all encompassing. It can be one image that helps open up our imagination in a way that we are able to answer questions or move in a positive direction. What Do Psychic Symbols Mean? One of the most common psychic symbols is the dragonfly. I consider the dragonfly to be almost a gateway to intuitive awareness, as it represents a connection to or a message from spirit. A dragonfly suggests adaptability and transformation, peace and tranquility. To sum it up, dragonflies represent spirituality. If you see an image of a dragonfly clairvoyantly, be sure to notice the colors, the direction it is flying, and if it is looking at you. All of these things are important as well, and can give you a more in depth meaning. All symbols can become multi-dimensional in their meanings, depending upon how deeply you wish to look. Take the image of a path. Often, this symbol comes up when we are looking for direction or for an answer as to whether we should proceed with what we are doing. It is very important to note the design of the path. Is it a paved road or a dirt trail in the woods? Is it clear from debris or covered with soft, warm leaves? Is it sunny, or dark and gloomy? These are all important factors when you are looking for answers. If it feels good, like the soft warm leaves, it's safe to assume it is a direction that is welcoming and positive. Alternatively, if there is only mud and sharp sticks or even hot tar and it's increasingly dark and shadowy, chances are you will not be happy continuing down that path. You may find yourself receiving an image of a fork in the road, another frequent symbol, indicating you need to psychically choose which direction to take. Maybe you are debating between two different careers or two different relationships. Look down each road at what lies there and you'll be better equipped to make a decision. I've Heard That People See Signs. Is There a Difference Detween a Signs and a Symbol? Signs, like symbols, help to guide us by gently nudging us or even forcefully putting us back on track in a direction that will help us. Signs don't have to be seen clairvoyantly. They can be solid or tangible everyday items. The universe sends us help in many ways. A client of mine, Lisa, lost her best friend to a life-long battle with cancer. One particularly emotional day soon after, she received the most incredible sign from her deceased friend. She was crying, missing her, and wondering why she had to suffer while she was here on earth, and why she had to be taken from this life where she was a wife and mother. Something stirred inside her, causing her to look to the sky, where she saw the brightest, clearest image: a gigantic sign was shining down on her. 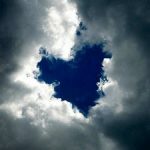 Clouds had joined together, creating a remarkably large, blue heart. She knew, without doubt, that her friend was sending her a message of love and support, letting her know she was all right, and that it was time for Lisa to move on with her own life and not be sad. Can We Use Symbols to Create Something? Using symbols to manifest something in our life is one of the easiest ways to guarantee what we are trying to bring to our lives will actually come to fruition. We can manifest everything from money to a new relationship. The key to successfully manifesting something we want is to be specific in what we are asking for. Using symbolic images, thoughts, and feelings, we are able to be more on point with our desires. Imagine trying to manifest something small, like a lunch date. Perhaps you don't feel like eating alone but you have no idea with whom you want to share your lunch hour. You can begin by seeing yourself, in your mind, sitting at a restaurant. Now, imagine you have your food in front of you on the table, and it is the most appealing, best tasting meal you've had in quite some time. Take it a step further, and envision yourself laughing at something that was just said by someone sitting at the table with you. Finally, look at your phone, in your mind, and see today's date and the specific time. Let it go. Say thank you to the universe for bringing this to you, and leave it alone. There is a good chance someone will contact you and ask you if you are free for lunch. Be open to all of the possibilities; if you don't hear from anyone, go by yourself. Be available if someone asks if they can "share your table because there are no others left." There are many ways the universe can bring you what you wish for; you just need to be receptive to the endless ways your desires may show up. Now, remember, you weren't specific. You didn't specify whether you wanted a male or female lunch date. You may end up with a friend or a romantic partner. Imagine having new money at your fingertips. How incredible would that be? Most of us would agree that an injection of cash would go a long way towards easing our path. So, instead of complaining about a lack of money, and bringing negativity into your money manifestation, begin by imagining a stack of cash. Visualize in your mind's eye the total, in dollars and cents, that you want to bring. Make sure you clarify whether this is in addition to what you already have, or if it's the total you wish to make. Then, imagine all of that money going into your pocket. Now, if it's money you want so you can purchase or do something specific, visualize that image as well. If it is for a down payment on a new car or even a house, see, in your mind, what that car or house would look like. Remember, the more specific you are, the greater the final outcome. Again, as with all manifestations, say thank you to God or the universe for allowing this to come into your life. If it's for your greater good, it will come about in some way. The hardest part about manifestation is not coming up with the symbols that represent what we want to bring into our lives. It is the simple act of letting go; letting go of the worry (negativity) that you won't receive it or that you're not worthy, and letting go of the control over how or when it's manifested. Manifestation is about the changing of circumstances to bring about what you want; it's not meant to be a focus on the how it's brought about, but instead the end result. If someone offers you a side job, or if someone wants to purchase your old car, those may be signs to consider that the universe is creating the cash you are looking to manifest. Pay attention! Take advantage of the opportunities! You need to be present to recognize the help you are being given to achieve your goals. Are Psychic Symbols Only for Psychics? The most important thing to remember about psychic symbols is they are present for everyone. Whether you are a practicing intuitive or someone who is merely curious, symbols are around us and available to help us everyday. When you are thinking about your deceased loved ones, pay attention to any thoughts, images, feelings, sounds, or even scents you experience; this may very well be their symbol that they are present with their love and support. Take it a step further and ask if they have a message or a gift for you. What impressions do you receive? Do you see an image? Hear a song? Regardless of how you get the message, they are sending you symbolic representations that you can now store in your own personal symbols databank. Enjoy these messages. Know that these symbols are there for you on a regular basis and that you can ask for direction and guidance to help you every day. Psychic symbols are the easiest way your loved ones, guides, and angels have to send you messages. Appreciate them, validate them, and above all, recognize them! Article originally published in The Llewellyn Journal. Copyright Llewellyn Worldwide, 2012. All rights reserved.